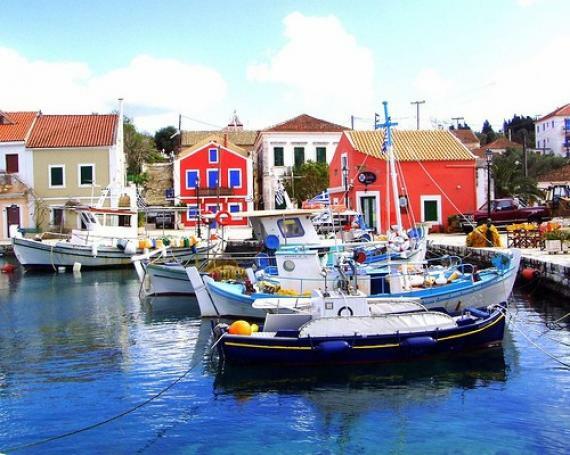 As almost all the Ionian islands, Kefalonia has rich cultural heritage and music plays an important role in the customs and traditions of the island. The locals honour their cultural roots by organising events based on traditional Kefalonian music and dances. These events are usually combined with local products, such as the famous robolla wine of Kefalonia. Of the music festivals held in Kefalonia, the most popular ones are the International Music Festival in Argostoli and the barcarolle in the picturesque village of Assos. The Rombolla wine festival in Fragata and other villages as well as the celebrations for the union of the Ionian islands with Greece are also accompanied by traditional music. The International Music Festival in Argostoli takes place at the end of August and features concerts with several contemporary Greek artists and other foreign musicians in different parts of the city. The barcarolle on the other hand is a one of a kind event that you shouldn’t miss. The scenery in the small, beautiful village of Assos is amazing on its own, but when the barcarolle takes place in August, you feel you are somewhere in Venice while you are listening the traditional Ionian serenades, called 'kantades' in Greek. The barcarolle is usually classical music with singers singing on boats like Venetian gondolas. “Kantades” on the other hand are typical rhythmic songs of the Ionian islands that people used to dedicate to loved ones and sing them under their balconies. In Assos, you will be able to listen to local singers singing serenades while you are looking at the starry sky and the fireworks! Kefalonia is known for its wine production and robolla is the most well-known local wine. Local associations organise this wine festival in mid-August every year, but the biggest event takes place in the village of Fragata. There you will be able to enjoy the robolla wine, tasteful delicacies such as local feta cheese and goat cooked in a special way while you take part in a lively feast with traditional music and dances! The festival 'Eortia' which takes place in Sami in the summer, it also includes cultural events with music, dance and theatrical plays. Another big event is also the celebrations for the anniversary of the Union of the Ionian Islands with mainland Greece in 1864. This is a lovely event with parades taking place in Argostoli. The local Kefalonian bands play festive music in traditional costumes. This day is also a bank holiday, therefore if you are on Kefalonia on 21st May, take into account that shops, banks and other facilities might be closed. What’s better than enjoying your coffee with Kefalonian music on a lovely spring day? The feast of Agios Gerasimos who is the patron saint of the island is one of the most popular events on the island. It’s a religious feast which attracts hundreds of people who queue up in front of the altar in order to pray and honour the saint whose body is lying inside the open sarcophagus. The atmosphere of the service is really festive as it is accompanied by the choir of Kefalonia. Outside of the church there’s an open market selling from souvenirs and religious icons to clothes and other goods. This is quite common in popular religious feasts in Greece, but if you would like to attend this one, you might need to book your accommodation well beforehand, as the crowd is so big that many believers end up sleeping under the trees in front of the church. There are several other religious feasts on Kefalonia, such as the feast of Agia Efimia in July and the feast of Agios Spyridon in October, but the most special one is the feast of Virgin Mary on 15th August. This is a bank holiday everywhere in Greece as it is one of the most important religious events, but this day here in Kefalonia, and particularly in Markopoulo, is surrounded with legends and myths. The legend has it that every year the day before 15th August harmless baby snakes, known as the Virgin Mary’s snakes used to go to the church of Virgin Mary in Markopoulo and climb on the altar. Because of this legend, nowadays snakes are taken to the church in honour of the Virgin Mary, called Fidousa as an association to the snakes. Despite your religion, feel free to join the religious feasts as they are part of the Greek culture. The rich music and cultural background of Kefalonia is obvious with a large number of events organised especially in the summer months. Enjoy your holidays on the island by adding some cultural flavour!